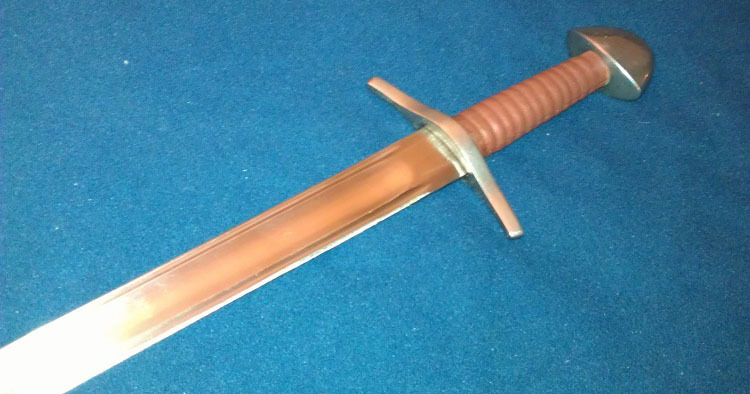 The Practical Norman Sword by Paul Chens Hanwei forge represents in many ways the gold standard for low priced but still quite sturdy and functional medieval swords for re-enactors. 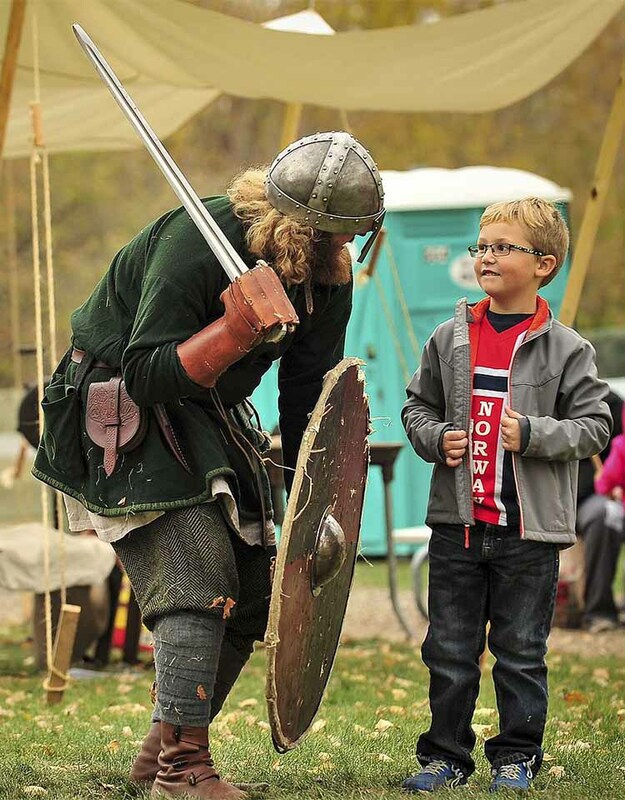 Almost all of their 'practical' series medieval and Viking age swords are priced under $150 and are designed for (relatively) safe steel on steel contact and/or controlled sparring. Though of course, as they are made from steel - they could still deliver a potentially lethal blow if safety issues are not properly monitored. Because they are pretty well build and durable swords, some people like to customize or sharpen them up like Brendan Olszowy did in his review of the Practical Viking Sword though as they are rebated it's a bit of a herculean task - but good training and a cheap way to practice blade customization (over the years, Brendan started making his own swords - and now sells amazing quality original swords of his own priced at the thousands of dollars). So what exactly should you expect from the Practical Norman Sword and it's cousins? Let's take a look and see.. I bought this sword nearly five years ago at a renaissance fair. I went to different sword salesmen and looked at and tried different swords, but I fell for the Practical Norman Sword due to its simple design and northern heritage. Also, I was only 16 at the time and my parents wouldn't allow me to buy a sharp sword, so it had to be a stage combat blade lol. This sword simply fit the bill. "The Hanwei Practical Norman Sword is based on a classic 11th century pattern popular during the Norman Invasion of Britain." I was lucky enough to be able to handle this sword prior to purchasing it (always feels nice to know what you're buying), and it feels really well built and sturdy. Nice, plain and simple overall, with meaty steel fittings. 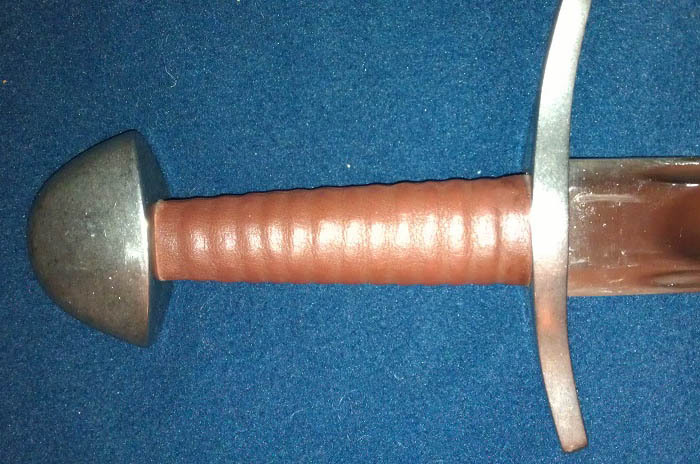 The pommel is peened, and well done at that. No rattle or looseness at all, after five years of use! Not very heavy use I admit, but still. It feels very solid. Fits nicely in the scabbard too, can be held upside down without falling out and doesn't rattle unless heavily shaken. The pictures below make the fittings look rough for some reason, in real live they are more like satin polished and very smooth. Don't know why, but the pictures make them look badly worn, almost rough ground... They look a lot better in real life, just to let you know. To be honest, I would've preferred it if the POB would've been slightly closer to the hilt. As it is now, it feels slightly tip heavy and doesn't handle as well as I think it could've. Could be my inexperience with medieval swords playing in though, I don't really know what's normal with regards to handling, speed and sharp turns. But I'd say this is more of a "Follow through on your cut"-sword than a "change direction mid cut"-sword. But now I'm getting ahead of things. I really like the satin finish of the blade, looks very functional and genuine. Not too fancy at all, rather subtle. Rather plainly fitted too, very simple (which I find aesthetically pleasing) and subtle. Doesn't shout "Look at me!!! ", just sits silently in the corner. A modest sword! Thick rebated edges mean that if you do decide to sharpen it up, you are in for a LOT of hard work..
Fittings are steel, with lots of grunt to them. Feels like a really meaty sword overall, solid and heavy bits everywhere. 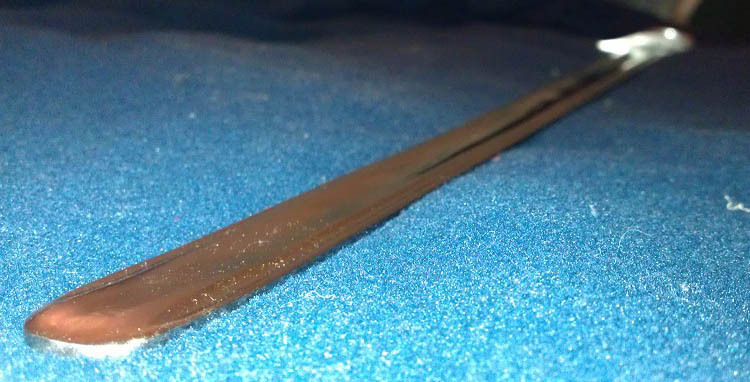 The blade is made from spring steel and has a good amount of flex to it (almost on the whippy side, but not wushu sword whippy), bends plenty and still returns to true. Edges are blunt, tip is rounded and has a bit of extra meat to it to blunt it even further. I see no problem in using this sword for stage combat, feels safe. 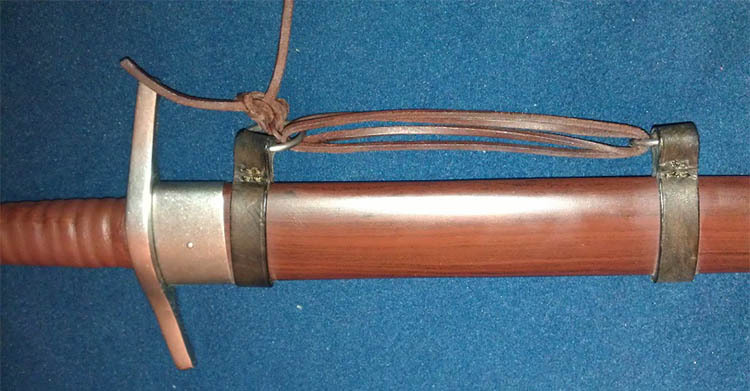 The scabbard is plain and simple and looks like it's made from wood. I've heard that it could be composite, and if it is it's a really convincing imitation. So convincing in fact that I still think it's real wood. Has a nice little end cap which blends well into the theme of the sword. Feels well made, not rattle unless heavily shaken and holds the sword even when held upside down (as previously stated). As I said before, I think it would've been nice if the POB (point of balance) was slightly closer to the hilt. The sword handles nicely and doesn't weigh very much, so it can still perform quick cuts and turns. But you have to fight it to make it change direction mid-air. Don't know if it's supposed to be like this as my experience with this type of sword is limited, but I would've preferred a bit more speed and agility. I like this sword. I've now grown up (lol) and would prefer if I could do some backyard cutting with it, so my next project for this sword is to sharpen it. But I would definitely recommend this sword to someone looking for a stage combat sword, it's very durable and nicely constructed. Feels solid, sturdy and well built. price is good as well, I could easily see how this sword (which is currently in the sub$100 range) could cost more. A good buy if you ask me. Big blunt edges for safety. Good amount of flex in the blade, won't deform easily. POB too far towards the tip of the blade (for my tastes). Possibly a little too plain when it comes to fittings, if you don't like minimalism. Blunt edges mean no cutting (not intended for it though, don't buy this sword if you want to cut! ).